I absolutely love it when close friends trust me with their special memories. It means so much to me that I get to witness and share in their joy! I met Tony and Megan when I first started dating my husband. He and Tony grew up together and are really good friends. I met Tony the first time Nic asked me to go duck hunting, in the freezing cold. I think I kept the fire going while they stood in the duck blind, and actually now that I think about it, I haven’t been duck hunting since. haha! When Megan and Tony were expecting the arrival of their oldest child, Wyatt, they had asked me to capture those maternity portraits, and funnily enough we did incorporate some duck hunting gear. It was quite funny! This go around, we met at Poinsette State Park in Pinewood, South Carolina. 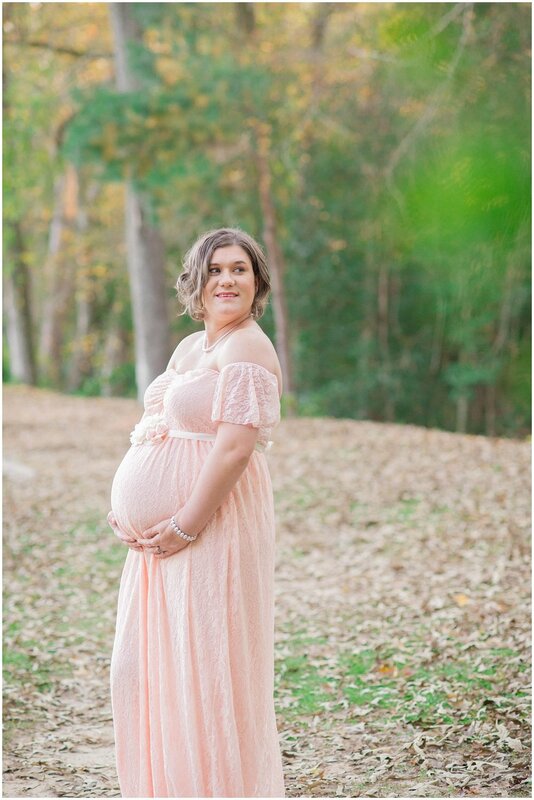 Megan wore a gorgeous, soft pink, off the shoulder lace gown, paired with pearls; a true southern woman’s staple. Wyatt kept things fun and per most three year old little boy’s style, he just wanted to climb on a pile of rocks. He did sit and smile long enough to grab a shot or two of his cute self! We did also manage to get a few great family portraits as well. I understand how much little one’s would rather be running and playing as opposed to acting serious in front of a camera. We ended with Wyatt reading us the most precious book that told tales of the adventures of Wyatt and Alice. Baby Alice is so loved and I just know Wyatt is going to be the best big brother there ever was. I am so excited to get to meet Alice in the next few weeks, and I have a feeling she is going to be as beautiful as her momma and as strong as her daddy! Check out this beautiful family’s session below, and leave some sweet words for these soon to be parents of two!